Click on the button the red arrow points to and follow the instructions. In addition, you will also be able to choose your Character's avatar, body type, item location, Character sheet style and a lot more all for FREE. See the screen shot on this page. 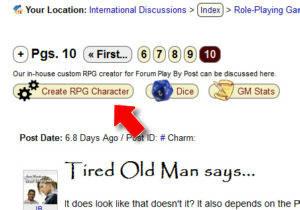 If you will first like to TEST first, then join the Community, validate your Email and then use this button: Create Text RPG Character or if you do not want to register now then check the Example. 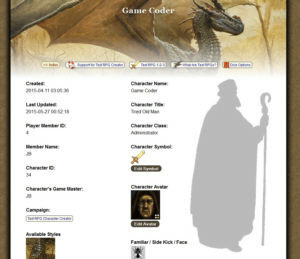 The above example is in the Support Thread of the Text RPG Creator and does not belong to any particular RPG, but the Creator itself can for any RPG as it is flexible.